Celebrate spring with a little fun this year. These egg heads are easy and fun to make and add a little green to your table or window sill. 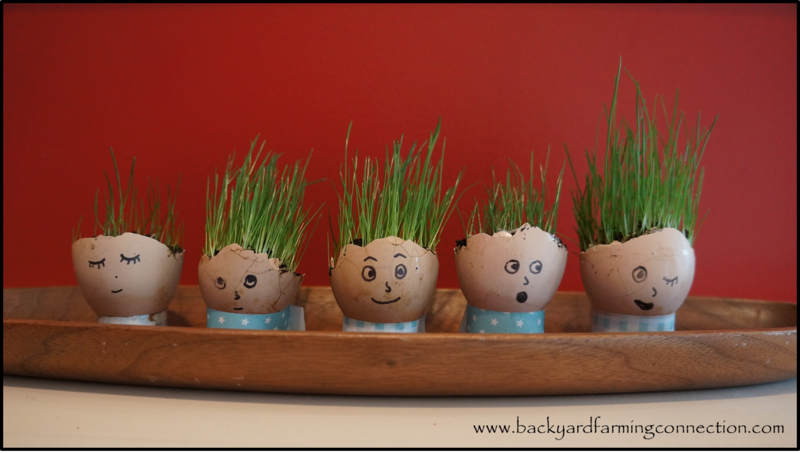 They're simple to make with only grass seed, soil, and of course fresh eggs, and it only takes about 10 days to sprout a head of hair. Thinking the chickens might like these little treats when I'm done with them, but I'm wondering if chickens pecking out these little heads might be a bit disturbing? CUTE-- I'm going to plant bird seed in my egg shells-- as our parakeets-- like fresh greens-- they will love it!! do you have to put holes under those shells? You could - especially if you wanted them to be around for a while. I just watered them a tiny bit each day so they were never completely flooded, but always damp. Too cute! I love this idea. I bet the chickens would enjoy them when you are done, but like you said, may look a bit creepy! Haha.